Update: 11 APR 2016: I have updated this Excel file to fix some formula errors and automate the coloring of the pie charts. See more info in the More Ancestry Pie blog post! 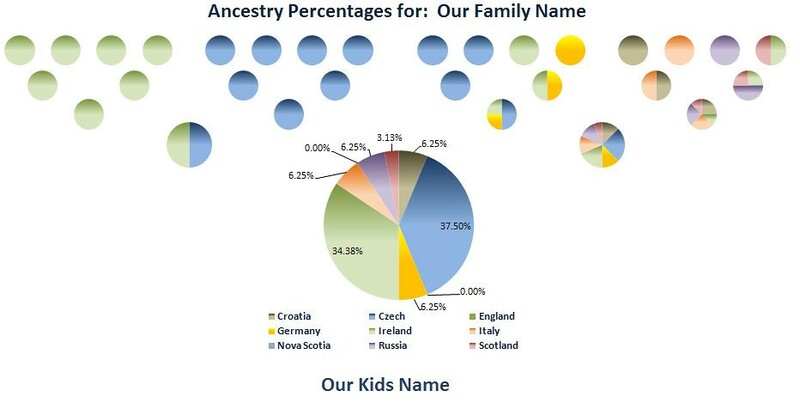 After seeing a post online recently about creating a pie chart for of one’s ancestry, I thought it might be fun to create a spreadsheet that could calculate someone’s ancestry percentages by country and create a set of pie charts that mimics a standard ancestor chart. After entering the GG-Grandparent’s ancestry, everyone else’s is calculated from those and a group of pie charts is created on a separate sheet. I welcome any ideas and suggestions for improvement – I can’t promise any support, especially if it is used with versions of Excel older than 2007, but I’ll do my best to take a look. It can be downloaded from my Downloads page. Be sure to look for the latest info and updates on the post More Ancestry Pie. 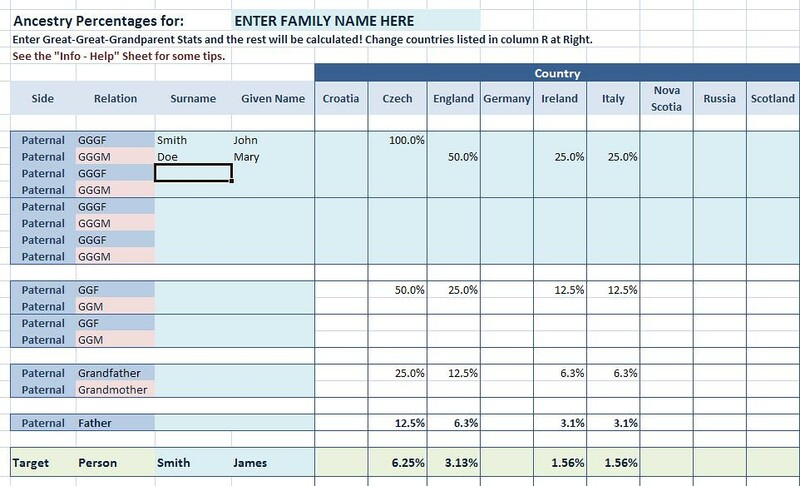 I tried downloading this Excel spreadsheet to possibly use on my blog (with due credit, of course), but I couldn’t change the country names. Would it be possible for you to tell me how I can make it calculate for Finland, Norway and England? Thanks! The problem was that I had a column to the right of the main names sheet where the Country names could be edited. That was kind of a clunky way of doing it and was a holdover from an earlier version. To make it easier, I’ve updated the spreadsheet so you can just edit the column headings in the main page – makes much more sense that way. I also corrected a few issues with the chart pages. You can download the new version using the same links in the post. There is some bugginess with Excel’s handling of pie chart styles – If you notice anything country colors changing from pie to pie, Excel sometimes likes to revert to default colors. I’ve tried to work around the issue by using the same exact pie chart over and over and then manually changing the source data in each, but Excel keeps playing whack a mole and reverting things like font names and sizes too. If you notice anything particularly off, let me know and I’ll get out my hammer again! Thanks in advance for sharing it on your blog – glad it has been helpful! By the way, for anyone reading this: I have protected the individual sheets in the Excel spreadsheet to avoid people (any myself) making any changes that affect the charts and formulas. But, I have not password protected them, so anyone who has Excel skill and would like to try changing anything can do so. To Unprotect a sheet in the more recent versions of Excel, click on the “Review” tab at top then click “Unprotect Sheet”. Thanks to Sue Griffith for letting me know about some errors she found in the formulas in this chart – I hope to take a look at them soon. For now, check out her blog post with a tweaked version of the charts – looks great! It is certainly possible to expand the sheet out to 3rd great-grandparents, but would take fair amount of time to reconfigure and I am sorry to say I don’t have time to do so. You’d have to add 32 more rows at the top and bottom to cover both the maternal and paternal sides, then set formulas for the 2x-grandparents to use the 3x-grandparents’ percentages to calculate and pass down to the nearer generations. Also, I’d have to assume if you want to go back that far that you have more nationalities to include than the 10 there are now, so you’d have to add some number of columns for more countries. Then the real bear of the job: adding 32 more pie charts. I appreciate the time and effort you spent creating the spreadsheet as well as sharing it with those of us who are also interested in our heritage. Download a day or so ago – thanks. Very interesting exercise. I found the far right country column wasn’t included in the totals all the time. Easy to fix, but thought you might want to know. The sum only goes to column O, but there is a column P.
Also thought you might like to know that in the excel options there is one buried waaay down the list that alows you to display/ not display zero values in a given worksheet. I had to finally put instructions in Evernote as I only use the feature every so often. Nancy, Thanks for the heads up for the missing column in the totals! I do know of the suppress zero values setting – I haven’t checked the latest version of Office, but in previous versions that only hid zeroes in cells and did not affect charts. I’ve fixed the totals error already, but will wait to upload a new version for a bit. If I have time at lunch I’ll take a look at the whole sheet and the charts and comb for other things I may have missed, or might be easier done in Excel 2013. I’ll post another comment here and tweet it out as well. Even with the capcha field enabled on my comments, getting a ton of spam through this particular post. Thanks 3rd world spammers! disabling comments here – if you have any questions about this post and spreadsheet, please use my contact form.